And this idea has been confounding believers for most of Christian History. Jesus made it overt in Matthew 28:18-20, where he tells his followers to go and make disciples of all nations, baptizing them in THE NAME of The Father, and of the Son, and of the Holy Spirit. 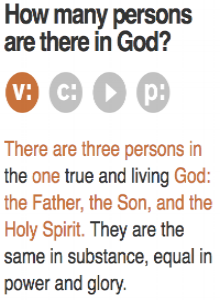 The ONE NAME, with THREE NAMES (Father, Son, and Holy Spirit). Here is some of the beauty of this. The One God of the universe exists as a relational community. The Glory that God seems to be seeking for himself throughout the Bible is more like the Father seeking glory for the Son and Spirit, the Son seeking glory for the Father and Spirit, and the Spirit seeking glory for the Father and Son. It is such perfect love, that we can understand the act of creation as the generous overflow of perfect love. More love leads to more love, and the Trinity is the source of it all! We'll think more about this through the week. But this gets us started. Do you have these gifts of the Spirit?